The Peralta Stones are fakes! About once a year someone discovers the Peralta Stones and immediately jumps to the conclusion that they have at long last found the key to the whereabouts of the Lost Dutchman Gold Mine. And without further ado, not even a flake of gold, or any serious research, they immediately want to tell everybody about it. I hope no one is taking all of this too seriously and investing a lot of time and money in any scheme to recover the Dutchman’s treasure based on the clues in these stone tablets. There are no legitimate clues there. The Peralta Stones are fakes! There is no doubt about it! They’re not even very good fakes. The whole thing is a hoax, dreamed up and perpetrated by God-only-knows who for God-only-knows what reason. The evidence is clear, convincing, and unequivocal. I’ll admit that I’m not an authority on The Lost Dutchman Gold Mine legend, or any other legend. I’m not a gold miner or an authority on mining, either. I’m just a scribbler who likes to read and write about early Arizona and the Southwest. I have, however, collected a fair amount of information about the Lost Dutchman legend, prospecting, and gold mining in territorial Arizona. And I spent more than thirty years of my life as a federal criminal investigator, which has left me with a suspicious mind and a fair ability to evaluate evidence and arrive at reasonable and sound conclusions. More than sixty years ago, I was a boy growing up in the Arizona desert east of Phoenix. My friends and I spent a lot of time hiking and camping in the Superstition Mountains. We all knew of the Lost Dutchman legend, of course. For a few years we were all determined to find the mine and recover the treasure; although, we didn’t know a thing about gold mining, and not one of us would have been able to identify gold in it’s natural state had we fallen into a mine. A few years ago, I wrote a story about Jacob Waltz and the Lost Dutchman legend  actually, it was an exercise in a creative writing course that I was taking at the time  and it was published as Quest for Gold. It is fiction and identified as such, but I believe that it contains more fact than most of what has been written about the Lost Dutchman legend. I concluded that the source of Jacob Waltz’s wealth, such as it was, was not in the Superstition Mountains. Of course, that conclusion caused some indignation among the Dutch Hunters, as the modern Lost Dutchman searchers like to call themselves, and my conclusions in Quest for Gold have been challenged many times. Almost every time that something like the Peralta Stones is rediscovered and labeled "New evidence of the location of the Lost Dutchman mine," I hear from the Dutch Hunters: "See, there! The mine does exist! And it’s right up there in the Superstitions." No one has yet convinced me. There are several accounts of where and how the so-called Peralta Stones were found, but none of them hold up to even casual scrutiny. At this point in time, it doesn’t make a lot of difference where they came from; there doesn’t seem to be any grounds for criminal prosecution, and the statute of limitations would have long since run, anyway. The stone tablets are now in possession of the Arizona Museum of Mines and Minerals in Phoenix. They’re not on display, but the folks at the museum will be happy to show them to anyone who is interested. They’ll also be happy to tell you what they know about them, which is plenty. No one at the museum believes that they are anything but a hoax. I’ve seen them, I’ve handled them, and even to my unschooled eye, they are a joke. The stones have been examined by a number of experts in various related fields over the years, but the most careful and pains-taking examination was by Father Charles Polzer, a Jesuit priest and a well-known ethnohistorian associated with the Southwestern Mission Research Center at the Arizona State Museum. Father Polzer’s work is highly regarded, and he can easily be described as eminent in his field. He reportedly laughed when he was told that the drawings were purported to be more than a hundred years old. Upon close examination, Father Polzer found that the surface of the stones had been milled with modern machinery before the drawings were inscribed thereon. And he went on to say, "...the drawings were cut into the stones with modern tools. The language and lettering is modern, if somewhat illiterate Spanish, clearly not colonial Spanish. The heart shape drawn on stone #3 is strictly of Northern European or Anglo character; Spaniards never depicted the idea of a heart with this kind of geometry." He went on at length describing more discrepancies, and in the end he concluded that, "...the stone carvings are a hoax of relatively recent origin." A magazine writer I met in Apache Junction, Arizona, a few years ago told me that he had considered using photos of the Peralta maps to illustrate a series of magazine articles that he was writing at the time. The stones were on display at the Southwestern Museum in Mesa, Arizona, and he arranged to examine them closely with a stone cutter who had years of experience carving names, dates, and other data on gravestones. The stone cutter told him that the Peralta Stones were bogus; the lettering and drawing, though crude in appearance, was too smooth and uniform in places to have been done with hammer and chisel. He suspected an amateur carved the stones with an electric drill or a grinder and then roughed them up a bit to create the appearance of age. He didn’t know of Father Polzer’s analysis, but he came to many of the same conclusions. He was sure that the surface of the stones had been smoothed by machinery rather than by natural erosion or friction between two stones, which was the standard method of smoothing stones for carving a hundred years ago. The writer  I don’t recall his name and haven’t seen him since  decided not to mention the Peralta Stones in his articles. Much has been made over the years of the drawings on rocks and canyon walls in the Superstition Mountains. I’ve seen some of them, and frankly, I can’t make head or tail of any of them. I seriously doubt that any of them have any connection with the Lost Dutchman mine or any other treasure. Petroglyphs are common in the Southwest. I believe that the original drawings were probably made years ago by indigenous Indians, and then they were added to over a period of years by others, possibly Spanish miners, early Mexican and American travelers, or latter-day high school boys hiking in the mountains. If they have ever led anyone to a pile of gold anywhere, the lucky hunter has been mighty quiet about it. One writer claims that the phrase El Cobollo De Santa Fe inscribed on one of the stones was a common saying meaning, "Good luck on the trail." The Spanish word for horse is misspelled; caballo is correct. The term el caballo de Santa Fe appears in Spanish language literature, but I am unable to find anyone who can recall ever seeing it used in the context of "Good luck on the trail." The words simply do not lend themselves to that meaning. In a story about early California missionaries, a priest is quoted, "Yo soy el caballo de Santa Fe." In the context in which the phrase is used, the priest clearly means: "I am the horse (the servant) of the Holy Faith." In another story, a tax collector in conversation with a wealthy merchant in New Mexico in the early 19th century says, "No tengo la culpa, Señor. Yo soy el caballo de Santa Fe, nada mas." Here he clearly means: "It’s not my fault, sir. I am the horse (the servant) of Santa Fe (the seat of the territorial government), nothing more." I’m sure there are many other examples, but I don’t have the patience or the inclination to look them up at the moment. I’m going to venture a guess that the person who did the scribbling on the Peralta Stones was an English speaker with little knowledge of the Spanish language and culture. The mistakes in the Spanish are such that I am led to this conclusion, but that’s only my opinion. A number of people have alleged that they have compared the drawings on the stones to topographical maps of various places in the Superstition Mountains and found them to coincide with the terrain. I have no doubt that I could make rough tracings from the stones and superimpose them over approximately corresponding terrain on dozens of contour maps of parts of many mountains in the Southwest with about the same results. It’s a game, child’s play, and it’s meaningless. Many people have been convinced of the authenticity of the Peralta Stones because the Peralta family name is mentioned so often in the history books. It’s true that the Peraltas were many and that some of them were quite prominent in business and in politics in their time. Don Pedro de Peralta was installed in 1609 as the first governor of the Spanish Territory of New Mexico. The territory actually had a more elaborate Spanish name suggesting a kingdom, and it included almost the whole southwestern quarter of the United States, but it’s usually referred to as the Spanish territory, so I’ll leave it at that. Don Pedro was so far from Spain that he did pretty much as he pleased in the name of the king, and he appointed his relatives to all of the important government posts in the territory. He also had the power to make land grants in the name of the king, and he did so for several of his friends and relatives. One of the largest Spanish land grants in the New World was the famous Peralta holding in California, which was held intact until the late 19th century by Don Luis Peralta and his heirs. Peraltas multiplied at an astonishing rate in the New Mexico territory, as well as in Chihuahua and Sonora. Peralta became a common family name, and there were thousands of them by the middle of the 19th century. Today Peralta is still a common surname in Mexico and the U.S. Southwest. The Phoenix telephone directory lists dozens, and every city in California and New Mexico has its fair share of Peraltas. So who are these particular Peraltas who figure so prominently in the Lost Dutchman legend? The two blamed most often are Pablo Peralta and his youngest son, Miguel. They were real people, prospectors and miners; however, I fictionalized their roles somewhat in Quest for Gold. Pablo Peralta owned a silver mine in Ures, Sonora, for many years, but by the middle of the 19th century the silver was about exhausted and corruption in the local government forced him to abandon the mine. He moved his family to the Mother Lode country in Central California. There is substantial documentary evidence of their presence in Tuolumne County during the Gold Rush years. It was probably about 1863 when Pablo and Miguel left California and went to Arizona. They held a registered mining claim on the Agua Fria River a few miles from present day Black Canyon City, and they called their mine the Valenciana, the same name as the abandoned silver mine in Mexico. The existence and location of that mine is well documented, and prospectors today occasionally rework the tailings that the Peraltas left behind. In all probability, the Valenciana produced a fair amount of gold, but Indian raids were always a problem, and Pablo and Miguel were attacked several times. During one of the battles an Indian with a lance seriously wounded Pablo. Miguel then sold the mine to a group of investors from California, and they moved to the new town of Wickenburg, about a hundred miles to the southwest, which was booming after the discovery of the Vulture mine. Shortly after they arrived in Wickenburg, Pablo died of his wounds. Miguel then opened a dry goods store, married, and prospered. He opened a second store in Seymour when the Central Arizona Mining Company constructed its stamp mill there in 1879. Later on, he moved to Phoenix where he opened a larger general merchandise store at the corner of Washington Street and Center Street  now Central Avenue  the geographical center of the modern Phoenix. The relationship between Jacob Waltz and Miguel Peralta portrayed in Quest for Gold is fictitious; however, it’s reasonable to assume that they knew each other at least casually. They were in the same places in California and Arizona at the same times, and they were doing much the same thing, looking for gold. Miguel was well-known in Phoenix, and Phoenix was a small community in the 1880s. Nevertheless, I am convinced that neither Pablo nor Miguel had any connection with a gold mine in the Superstition Mountains. I doubt that they were ever anywhere near the Superstitions. Although there were several authentic Spanish land grants in what is now the state of Arizona, none of them involved anyone with the surname Peralta. However, there is reason to believe that Miguel was involved with Doc Willing and James Addison Reavis in the infamous Peralta-Reavis Spanish Land Grant affair, which was a complete fabrication and a fraud. Doctor Willing died of natural causes in 1872 before the fraud was discovered, James Addison Reavis ultimately went to prison for his part in the scheme, and Miguel fled to Mexico. He later took his own life in a Nogales, Sonora, hotel room. But that’s another story. All of this, of course, does not preclude the possibility that some of the other Peraltas may have mined gold and/or silver in the Superstition Mountains during some period of time. There is evidence of early Spanish and Mexican mining activity in the general area, and it’s reasonable to assume that some of the Peraltas would have had a hand in it, given their numbers and the prominence of the family. Getting back to the Peralta Stones, one writer assures us that Professor Dana, a geologist at the University of Redlands in California, examined the stones and issued a letter attesting to the fact that they were more than one hundred years old. If such a letter ever existed, I know of no one who has ever seen it or knows what may have happened to it. I can find no record of it anywhere. The University of Redlands was founded as a liberal arts college in 1907. The university has since covered a broad field of studies over the years and currently offers more than forty majors in thirty departments. Professor Dana is not presently on the faculty, and the person I talked to in the admissions office had never heard of him. She couldn’t tell me if he might have been on the faculty prior to 1965, but if he was there, he couldn’t have been a professor of geology. Geology has never been taught at the University of Redlands. There have been a number of published comments in Desert Magazine since the stories about the Peralta Stones were published, and many of them serve to confuse the issue even more. One writer wrote that the father of a friend had been the Arizona State Mine Inspector during the time Jacob Waltz was alive, and he contended that Jacob Waltz’s gold looked like it was highgraded from the Vulture mine. When Jacob Waltz died in 1891, Arizona was a territory; statehood did not come until 1912. The territorial government registered claims and protected property rights, after a fashion, but it did nothing else to control the mining industry. There was no mine inspector in Jacob Waltz’s time. The first mine inspector in Arizona was appointed in 1912; however, he didn’t actually get around to inspecting any mines until late in 1913. Jacob Waltz had been in the ground more than twenty years and the only gold samples known to have been in his possession had disappeared on the day he was buried. It is, of course, possible for a trained individual to determine with a reasonable amount of certainty what mine or mining district a particular ore sample came from, but the process is more involved than just looking at an ore sample. One chunk of ore looks pretty much like all other chunks of ore to the naked eye. However, there are many people who still believe that Jacob Waltz’s gold was stolen from the Vulture mine. I don’t believe it for the simple reason that every merchant in Wickenburg was buying highgraded Vulture gold directly from miners in those years. Certainly they knew that the gold was stolen from the mine, but there were no questions asked and no tales told. There was no reason for Jacob Waltz to travel all the way to Wickenburg to buy highgraded gold from the miners, and there is not one scrap of evidence that he did so. There is evidence that Jacob Waltz went to Wickenburg with Jack Swilling and a group of German miners from the Weaver district in 1863. Swilling, an engineer, went there to build the Corbin mill on the Hassayampa River about eight or ten miles northeast of the Vulture mine. And there is also evidence that many of those who helped in the construction stayed on to work at the mill after it was finished. The Corbin Mill processed a considerable amount of ore from the Vulture, and Waltz would probably have had access to Vulture gold at that time. It is most likely, however, that he never actually worked at the Vulture mine. It is equally probable that Jacob Waltz left Wickenburg when the Corbin mill closed and Swelling and his crew of German immigrants went to Phoenix to dig irrigation canals. The first canal was called the Dutch Ditch because so many of those involved in its digging were Germans, all of whom were offered quarter section homesteads when the ditch was completed. Jacob Waltz’s homestead is well-documented, so we can assume that he was one of the ditch diggers. All of this is speculation, of course, but it seems to me to be reasonable speculation, much more so than the stories that have him living in Phoenix and running back and forth to the Vulture mine to fence gold ore for the miners. Sixty miles was a long trip in those days. I don’t know if the Lost Dutchman gold mine ever existed, but if Jacob Waltz did have such a mine, I doubt that it was in the Superstition Mountains. The experienced prospectors and gold miners that I have talked to in recent years have told me that the amount of gold likely to be found in the Superstitions isn’t worth the effort to locate it. Phelps-Dodge Mining Company, one of the largest in the world, surveyed the mountains years ago and came to the same conclusion. But Jacob Waltz did have a lot of gold when he was living in Phoenix, and its source has never been satisfactorily explained. Let’s keep in mind, though, that he was a prospector and a gold miner all of his life, and he was pretty good at it. The Southwest desert is full of gold; you just have to know where to look, how to recognize it when you find it, and how to get it out of the ground and into your pocket. None of that would have been much of a problem for Jacob Waltz. If Mr. X, the latest treasure hunter to find and interpret the infamous Peralta Stones, is digging in the Superstition Mountains, he’s going to be in a heap of trouble when the rangers catch him, and they surely will. The western portion of the Superstitions was made a national wilderness area in 1983, and it’s been closed to prospecting and mining ever since. A few folks who had claims prior to 1983 were allowed to continue to work them for a time, but I don’t believe any of those claims are still being worked today. Limited treasure hunting can legally be done only with a permit issued by the Forest Service. However, when I last talked to a forest ranger in that area, they had not yet issued one permit to search for the Lost Dutchman treasure, and the ranger told me that it was unlikely that they would ever issue one. The real treasure of the Superstitions is in the scenery, the flora, and the wildlife, and the forest rangers are serious about protecting it. I, of course, don’t know where Mr. X is excavating; however, if he’s in the desert west of the mountains, where many people believe the treasure is located, he’s just as likely to be in trouble when he’s caught. Digging in the Lost Dutchman State Park, on Arizona State Trust Land, or on private property without permission could result in serious consequences. I believe at last count there were one hundred thirty-four people who have over the years claimed to have found the Lost Dutchman gold, but not one flake of gold that can reasonable be proven to have come from the Lost Dutchman mine has yet been produced. Yes...I’ve heard about the famous matchbox, and I don’t believe that, either. Brownie Holmes was about as credible as was his father. I am tired of reading selected opinions from people who are going to loose their "Great" reputations because they do not understand the Peralta Stone Maps. They cannot figure them out so they make a shot in the dark desision that the Sones are fake. It does not take the average person who has an average thinking process long to understand that maybe they are true. then again maybe they are false. The only people who have tried to discredit the Peralta Stones are those who have time and money at stake. They believe that their opinions about where the Peralta Mines are the only true answers. I bet that Mr. Botts would not put his reputation on the line .............but then maybe he aready has. Maybe his piped up beliefs he has spent so much time trying to get others to believe in is going to fall down around him. The answer is coming soon. You will be able to walk right up to the mines. The Mr. Botts of this country are going to disappear along with their theories. "The Peralta Stones are fakes! There is no doubt about it! They're not even very good fakes". "The whole thing is a hoax, dreamed up and perpetrated by God-only-knows who for God-only-knows what reason. The evidence is clear, convincing, and unequivocal". Mr Botts begins his rather long winded and wandering article with some pretty strong expressions of his "opinions" about the authenticity of the Stone Maps. He brings to attention his background as a federal criminal investigator, but shows no hint of any professional format or methodology in his evaluation of the Stone Maps. I spent almost an entire evening wading through his ramblings in search of his 'clear, convincing, and unequivocal evidence'. Were this individuals comments offered by you Mr. Botts as part of your "Clear, convincing, and unequivocal" evidence? Would it not be fair for us to at least expect a verifiable name from a former federal criminal investigator that is in the process of presenting us with his "Clear, convincing, and unequivocal" evidence? I suppose "Experts in various fields" is an example of Mr. Botts' "clear, convincing, and unequivocal" Evidence? Is this what our Government trains or federal criminal investigators to believe "clear, convincing, and unequivocal" Evidence is? "He suspected an amateur carved the stones with an electric drill or a grinder and then roughed them up a bit to create the appearance of age". Well, here we have a Stone Cutter! I am impressed now... I don't even care if he has a name or not, This is obviously "clear, convincing, and unequivocal" Evidence! I guess I will just have to let you win this one Mr. Botts! "the most careful and pains-taking examination was by Father Charles Polzer, a Jesuit priest and a well-known ethnohistorian associated with the Southwestern Mission Research Center at the Arizona State Museum. Father Polzer's work is highly regarded, and he can easily be described as eminent in his field. He reportedly laughed when he was told that the drawings were purported to be more than a hundred years old. Upon close examination, Father Polzer found that the surface of the stones had been milled with modern machinery before the drawings were inscribed thereon. And he went on to say, "the drawings were cut into the stones with modern tools. and in the end he concluded that, "the stone carvings are a hoax of relatively recent origin." At this point, I am very reluctant to trust Mr. Botts' ability or willingness to attempt to quote, evaluate or represent anyone else's opinion in any form of credible manner. I wonder if he could get Father Polzer to put any of this in writing for us all to review? If we are to believe everything Mr. Botts says, we could hire Father Polzer and the Stone Cutter friend of his and get rid of the entire FBI and close their Labs. One chilly evening in the winter of 1998, I was sitting beside campfire in the Superstition Mountains along with approximately 8 other individuals listening to the then former Attorney General of the State of Arizona (Mr. Robert Corbin) telling us an experience he had with these very same Stone Maps. To the best of my recollection the story went something like this: Someone had come to the AG's office when Mr. Corbin was the sitting AG, to file a complaint regarding the ownership of these Stone Maps. While in the process of attempting to make every possible effort Mr Corbin could think of to determine who actually was the rightful owner of the stones, The matter of where and when they were found and dug up brought into the situation, the question of whether or not they were covered by the Antiquities Law? Under the circumstances, Mr. Corbin confiscated the Stones and had them shipped to the FBI Labs (I believe he said in Washington, DC but I am not sure) to see if they could determine the age of the writing on the Stones, and/or anything else that might help determine their origin. Mr. Corbin told us that evening beside the campfire that when the FBI returned the Stones to him with their evaluation, that the only the thing the FBI would commit themselves to reporting about the writing on the Stones was that it was over 100 years old. Mr. Corbin then stated that in view of this information he determined that the Stone Maps, No matter who made them or why... Were covered under the Antiquities Law, and refused to return them to either of the parties claiming ownership. He then placed them where they are today at the Arizona Museum of Mines and Minerals in Phoenix to be preserved as Relics of Arizona History! Had it been possible to determine the actual method that had been used to carve these stones, I fully believe the FBI could and would have done it at that time. I mean no disrespect for the opinions of Father Polzer whatever they might be, or heaven forbid.... The unknown Stone Cutter, But I tend to put more faith in the above related story than anything Mr. Botts has presented herein. "If Mr. X, the latest treasure hunter to find and interpret the infamous Peralta Stones, is digging in the Superstition Mountains, he's going to be in a heap of trouble when the rangers catch him, and they surely will". "I, of course, don't know where Mr. X is excavating; however, if he's in the desert west of the mountains, where many people believe the treasure is located, he's just as likely to be in trouble when he's caught. Digging in the Lost Dutchman State Park, on Arizona State Trust Land, or on private property withhout permission could result in serious consequences". Since Mr. Botts states that he has no idea of where Mr. X is working, I can only assume that his experience as a former federal criminal investigator, makes him feel he has the right to fabricate the worst possible scenarios and suggest that Mr. X might be guilty of them! I do, happen to know where Mr. X's location is and wish to state here for the reader that his area is not in any of the areas described by Mr. Botts that are closed for mineral exploration. Seems to me that Mr. Botts would have had the necessary contacts to find this out prior to issuing his warnings to Mr.X. "There are several accounts of where and how the so-called Peralta Stones were found, but none of them hold up to even casual scrutiny". Perhaps Mr. Botts, a little more effort on your part, than you were willing to put forth, might be required to determine the truth about where and how they were found. Then again, it may be entirely possible that you would never discover the truth no matter how much effort you put into trying to find it. Still, this would not result in any kind of verification that nobody else knew the truth! "I believe at last count there were one hundred thirty-four people who have over the years claimed to have found the Lost Dutchman gold, but not one flake of gold that can reasonable be proven to have come from the Lost Dutchman mine has yet been produced". I don't know how to explain this to you Mr. Botts, you being a former federal criminal investigator and all, but someday you are going to have to admit to someone, sometime that there does exist certain bits knowledge in the world that has not been cleared through you! "Yes I've heard about the famous matchbox, and I don't believe that, either". Have you got some more of your 'clear, convincing, and unequivocal evidence' to support your theory of the FAKE matchbox, or is this just another one of those things you would like us to take your word for? Perhaps you would like to provide us with a few words from an old Jeweler who's name you can no longer recall that claimed the matchbox was really just a gold plated chunk of lead? Brownie Holmes was about as credible as was his father. I wasn't aware of the fact that you knew Brownie Holmes Mr. Botts. I never did get to meet and know Brownie myself, but I sure do know a bunch of people that did. Of all the people I know that knew him, to my knowledge, you are the only living person I have ever known to utter an unkind word about the man. I seriously doubt that your words will ever influence the way anyone ever remembers Brownie Holmes Mr. Botts. But... I would bet the Ranch, that they will forever influence the way a lot of people remember you! My article, The Infamous Peralta Stones, has been posted for a few months now, and it's generated about all of the rants I can expect. So I'll respond once and for all. My article is not and was not intended to be a report of an exhaustive investigation undertaken by me. I hadn't thought of the Peralta Stones or the Lost Dutchman legend in years, and the article, which I started as a letter-to-the-editor, was written from memory. I spent some time looking into this matter while I was writing Quest for Gold, and I stopped when it became clear that the stones are fakes. I don't intend to do it again. I'm not selling anything, and I stand to gain nothing. My only book on this topic, Quest for Gold, was clearly labeled fiction. It was an adventure story for teenagers, and it has been out-of-print for some time. My only motive was to warn anyone contemplating investing time and money in any treasure-hunting scheme based the so-called Peralta Stones to be wary. The Peralta Stones are clearly a hoax, and the evidence is readily available to anyone who cares to look. Father Polzer's credentials and his extensive writings are available at the University of Arizona, on the Internet, and in many libraries. The stones are in the custody of the Arizona Mines and Minerals Museum in Phoenix, and the staff there has quite a lot of background information concerning their authenticity. Every knowledgeable person who I spoke to about the Peralta Stones believes them to be fakes. Mr. Hatt's remark is the first that I've heard that the Peralta Stones were ever examined at the FBI Laboratory. I find that very hard to believe. I've had some personal experience with the FBI Laboratory, albeit a number of years ago, and I don't think that they would undertake such an examination. If an official of the State of Arizona had a legitimate reason to determine the authenticity of the Peralta Stones, there are ample resources for such an examination available to him within the state. If for some reason he wanted to have it done at the federal level, I would think that the Smithsonian would be the proper place to send them, not the FBI Laboratory. To me the evidence is clear; it is convincing, and it is unequivocal that the Peralta Stones are a hoax. If others care to believe they are authentic, that's their privilege, so long as they don't try to scam anyone with false promises of fortune in return for investment. To believe that my reputation rests on my opinion of something so silly as the question of the Peralta Stones is just plain ridiculous. And this will be my last word on the topic unless and until someone shows me the gold. Knowing very little about Father Polzer myself, I decided to do a little Internet research and see if I could find his comments on the Stone Maps on the Internet. My repeated attempts produced no results relating to the Maps, However. . . There is a lot of information pertaining to Father Polzer himself on the Internet. Contrary to Mr. Bott's beliefs, it appears that Father Polzer's opinion and credibility are often disputed, especially in cases where his conclusions might be a little self serving. "Her remarks about the government's failure to approach the Apaches are contrary to fact. The reality is that no Apache bothered to take up this cause until non-Indians coaxed certain long-term, political dissidents to block construction of the telescope". As shown earlier, this is a blatant lie. The Apache received no such letter and the EIS had a letter stating the Apache position on Mt. Graham. What makes Polzer's statements so incredulous is that fact that he was the curator of Ethnohistory and the Documentary Relations of the Southwest Project at the Arizona State Museum at the University of Arizona, which contains among other items, the Grenville Goodwin papers. Apache ceremonies do not leave traces or shrines, except perhaps a small fire area and scattered pollen. Even over centuries, there is no built evidence to prove possession. The Ninth Circuit Court echoed Father Coyne. The Apache had failed to show that the sacred locale first named by the Apache also included a second locale claimed by the astronomers. The second site was not proven to be sacred, in part, because it was 1,300 feet from the first. How could both be sacred? The more extravagant Father Polzer simply presented false information in courts: "Rarely did the Apaches use these heights, and the sacredness is about as specific as references to the sky." Now. . . Let's assume for just one minute that Father Polzer had immediately upon examination determined in his own mind that the Stone Maps were authentic and did in fact (If deciphered correctly) lead to some hidden Jesuit Treasure. Does anyone believe that it would have been in his own best interest to say so? In reference to the FBI evaluation of the Stone Maps. I have to admit that I have no idea if the FBI performed the evaluation or not, or if they sent them out for evaluation. I simply passed on a story that I heard told from Bob Corbin's lips myself. I personally cannot testify to the truthfulness of the story, but I can tell you this. I have never seen his credibility disputed in the way Father Polzer's is above. First, I would like to commend Mr Botts for placing all this info on his site for all the rest of us to comment on. I am a little taken back however by the fact that everything presented by Mr Botts is in the negative. In other words he only seems to quote and give credence to those who believe the Peralta Stones are a hoax. So I commend Mr. Hatt also for pointing out all the flaws in the arguments presented by the doubters. I personally identify with Mr Hatt. I have spent the last 24 years decyphering the Spanish Code system as used in the New World and I can state without hesitation that the code used in the carved Peralta Stones are 100% genuine. The stones employ the Spanish Alphabet code, Their Bible code, their numbers code and their is a ample supply of their code words as well. It appears that Mr. Hatt is correct when he states that people who don't understand the stones simply take the easy way out and call them phony. The Stones are genuine. Mr. Botts, in his critique of the Peralta Stones uses some rather dubious methods to discredit the stones. For whatever their reasons, "experts" have used disingenuous means to discredit something they really are not qualified to judge. 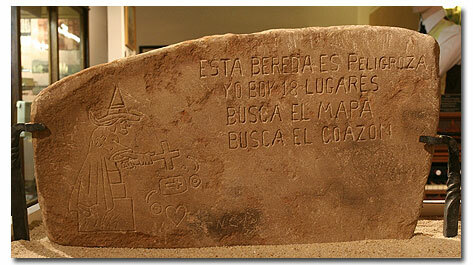 The first issue raised is the quality of the carving found on the Peralta Stones. How many of these so called "experts" have toured the medieval cathedrals of Europe? The stone work is superb - much better than the quality of the Peralta Stones and done centuries before the Peralta Stones. The "experts" claim it would take modern high tech equipment to replicate the Peralta Stones. Modern stonemasons will admit their craft has lost and forgotten many of the techniques of the medieval stonemasons. Yet, I've seen stonemasons in Mexico prepare beautiful headstones with nothing more than a mallet, several chisels and various forms of abrasives. My final argument to this issue is - did Michelangelo or Rodin use modern high tech equipment to produce their masterpieces? I think not. The second issue raised is the words and their spellings. As a citizen of an English speaking country, I've traveled to other English speaking countries and behold there are differences in the use and spelling of English words and phrases. This is common throughout the world - no matter the language. Even in Spanish speaking countries. There are hundreds of dialects of the Chinese language. Some Chinese cannot speak with other Chinese due to the regional differences in their uses of the Chinese language. Today, older Americans have a problem understanding younger Americans. Examples are endless. Anyway, the use of the words is immaterial - the words and their misspellings were added as a ruse to distract a person like a magician. The third issue raised is the use of the "Heart" symbol. A noted Southwestern historian provided his opinion the stones were fakes based in part on the expressed fact the colonial Spanish didn't use the "Heart" as a symbol. WRONG! During the later 17th century a famous series of visitations by Jesus Christ occurred. Jesus appeared to a woman by the name of Margaret Marie Alacoque who later became Saint Margaret Mary. The name Margaret Mary is one of the most popular names adopted by nuns. In her visions Saint Margaret Mary saw a "heart shape surrounded by a crown of thorns." These visitations were well known throughout the Catholic world. The worldwide Devotion to the Sacred Heart of Jesus and the Devotion to the Heart of Mary resulted. An order of Catholic Brothers called The Brothers of the Sacred Heart was organized. The Catholic Church says the "Heart" is a centuries old symbol of Christ on the cross. On occasion, the Society of Jesus (Jesuits) have been symbolically identified through the use of the "Heart." There are numerous 12th through 19th century cathedrals throughout the world that have stained glass windows containing "Heart" shaped symbols. I pray that when these "experts" arrive in heaven they're prepared to explain to Saint Margaret Mary. The last issue raised is the stone maps do not appear to relate to any area within the Superstition Mountains. The Florence Quadrangle Map of 1902 is often used as a basis. Until cartographers began using airborne radar, GPS, computers, satellite imaging, and laser surveying equipment, maps were commonly known to be imprecise. The maps made by the Spaniards of the 16th through the 18th centuries are notoriously imprecise compared to modern maps. Comparing two imprecise maps with each other in order to disqualify one is not good science. Compare the Florence Quadrangle Map to the modern maps made with the latest cartographic equipment. An "expert" might claim the Florence Quadrangle Map to be a "fake." Trying to precisely relate any feature on the Peralta Stones with reality requires the understanding the Spanish failed to have the latest in 21st century technology. The final solution to the stone maps does not in anyway require the use of the words. Also remember the Spaniards/Mexicans didn't have 21st century technology. KISS is what's needed to solve the Peralta Stones. I am writing regarding the article titled "The Infamous Peralta Stones" by Gene Botts. He states that the University of Redlands never had a geology department and could not find Professor Dana. I graduated from the U of R in 1972 having taken a year and a half of geology classes under Dr. Dana who was an expert in seismology, himself having studied under Dr. Charles Richter (as in Richter scale) at Cal Tech. So while the U of R no longer has a geology department, I can assure you that they did in the past and that it was headed by Dr. Dana. The secretary of the admissions office had probably not worked there long enough to know of the defunct geology department or the staff who worked there over 30 years ago. Even so, a geologist would not be the person to ask regarding the age of a stone tablet. He might shed light on the age of the rock itself, but not the writing on it. And in geological time, a hundred years is almost nothing. We have started an new section for posting reply to this and other articles. You can post pictures and edit your posts. Click here to go to the new sections.